Blake Koch picked up the 14th last-place finish of his NASCAR XFINITY Series career in Saturday’s Rinnai 250 at the Atlanta Motor Speedway when his #11 Leaf Filter Gutter Protection Chevrolet was involved in a two-car accident after 2 of the 163 laps. 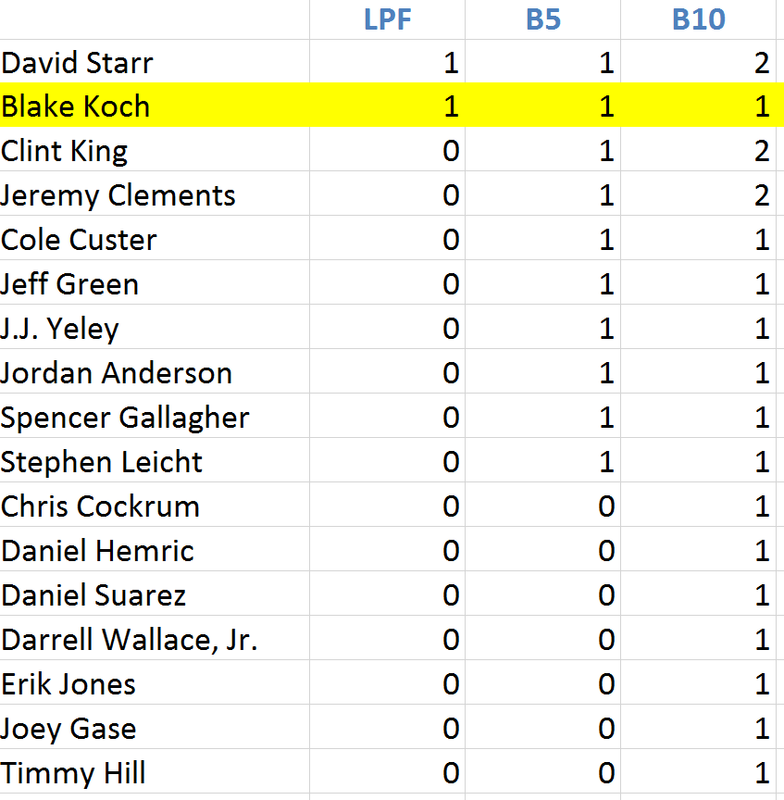 The finish, which came in Koch’s 182nd series start, was his first since September 26, 2015, 42 races ago, where his #8 Leaf Filter Gutter Protection Toyota crashed after 2 laps of the VisitMyrtleBeach.com 300 at Kentucky. At the time of the Kentucky finish, Koch was driving for TriStar Motorsports and enjoying his best XFINITY Series season at the time. In June, when he announced intentions to stay with TriStar in 2016, he’d nearly snatched his first victory at Road America, and he ultimately came home 17th in points. However, the plan changed over the offseason and Kaulig started his own team with Koch driving his #11 Chevrolets. The partnership paid instant dividends. Koch started the 2016 season with a 9th-place finish at Daytona, an 8th at Richmond that spring, and earned himself a spot in the inaugural XFINITY Series Chase. He continued to impress from there, surviving the first two elimination rounds and coming just short of making the Championship Four at Homestead, leaving him 7th in points. Driver and team have returned once more in 2017, where a gutsy 15th in the Daytona opener has again started them on the right track. 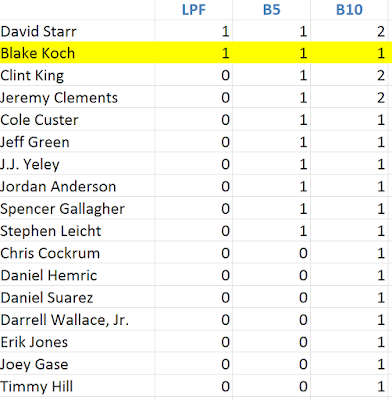 The preliminary entry list at Atlanta included Koch among the 40 drivers for 40 spots, but the list then grew to 43 with the additions of Joey Gase’s #52 LifeLinkFoundation.org Chevrolet for Jimmy Means Racing (a full-season effort that was for some reason left off), Chris Cockrum’s #25 Advanced Communications Group Chevrolet, and Obaika Racing’s #97 Vroom! Brands Chevrolet with Stephen Leicht. As it turned out, all three of these added entries made the race, bumping from the field Carl Long in Motorsports Business Management’s #13 TLC Vacations Toyota, and owner-drivers Morgan Shepherd in the #89 VisoneRV Chevrolet and Mike Harmon in his unsponsored #74 Dodge. Harmon’s exit was particularly costly as something caught fire in the engine during his qualifying lap, aborting his run. Koch, meanwhile, avoided the chaos. He ran 20th in Friday’s opening practice, 21st in the second, 21st in Happy Hour, and settled on 25th in qualifying with a lap of 180.029mph. Starting last on Saturday was Stephen Leicht, whose effort in the Obaika car marked his first run in any of NASCAR’s top three divisions since 2012. He was joined by Dakoda Armstrong and Brandon Jones, whose cars were sent to the rear for unapproved adjustments, but then elected to fall behind those two once more by choice. Also choosing to fall to the rear was Jordan Anderson, who was running double-duty between the XFINITY and Truck Series races held that day. Anderson was driving the #93 RSS Racing Chevrolet, a team car to Ryan Seig’s #39 that, for much of 2016, was used as a start-and-park entry. The decisions of Leicht and Anderson to fall to the rear seemed to indicate both cars would again be exiting early. At the end of Lap 1, Leicht held 40th, 8.695 seconds behind the leaders. By Lap 2, Anderson had again pulled behind Leicht and was preparing to come down pit road the next time by. Then, up in 16th spot, trouble broke out. Ty Dillon’s #3 Bass Pro Shops / Tracker Boats Chevrolet started 14th, but broke loose in Turn 3, sending him sliding to the apron. As several cars dodged his car, Koch chose the apron, only to find Dillon sliding straight across his path. 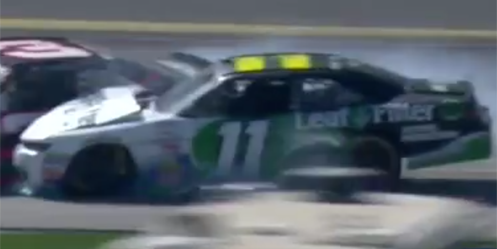 Koch slowed, but couldn’t avoid a collision, tearing up the right-front of his #11. With the damage unable to be repaired in five minutes, Koch was out of the race, while Dillon managed a 17th-place finish. Anderson and Leicht parked their cars after 2 and 24 laps, respectively, Anderson edging Koch to the garage for 39th. 37th went to Jeremy Clements, whose #51 Chevrolet, with backing from race sponsor Rinnai, erupted in smoke on pit road, then retired with suspension issues. Rounding out the Bottom Five was J.J. Yeley in TriStar’s #14 Superior Essex / Accu-Tech Toyota, out with engine failure. *This marked the first XFINITY Series last-place finish for the #11 since February 14, 2009, when Scott Lagasse, Jr.’s #11 America’s Incredible Pizza Company Toyota crashed after 71 laps of the Camping World 300 at Daytona. It’s only the tenth last-place finish for the number in XFINITY competition and the first at Atlanta. *This marked Koch’s first last-place finish in an XFINITY race at Atlanta since August 31, 2013, when his #00 M&W Transportation / SupportMilitary.org Toyota had ignition issues after 5 laps of the Great Clips Grit Chips 300. *This marked the first last-place finish for Kaulig Racing.